Earthquakes in NW Arkansas? Yep! Those of you who live in the northwest Arkansas area were recently 'rocked' by two earthquakes. These were both small being under 3.0 in magnitude. I hesitate to give out exact magnitudes because these are determined by looking at at data from several seismic stations (as is the location and depth). You can imagine that there are relatively few earthquakes in this part of the state, so the seismic network is lacking. So, why did these earthquakes occur? Have they happened before? Well, in short we don't know and not in recorded history. Yes there have been movements on faults that have been felt in Benton county before, but these two events are the only earthquakes originating in the county we know of. The first map shows recorded earthquakes since 1974 to the present (not including these two). You will observe almost none within 200km of the county. The initial hypothesis by a University of Arkansas professor, given the shallow depths initially calculated, was that these were the results of cave collapses. Karst topography (what we have in NWA) consists of layers of caves carved into the subsurface. It is not uncommon for these to collapse and the UofA professor cited the loud noises heard as support for the collapse theory. 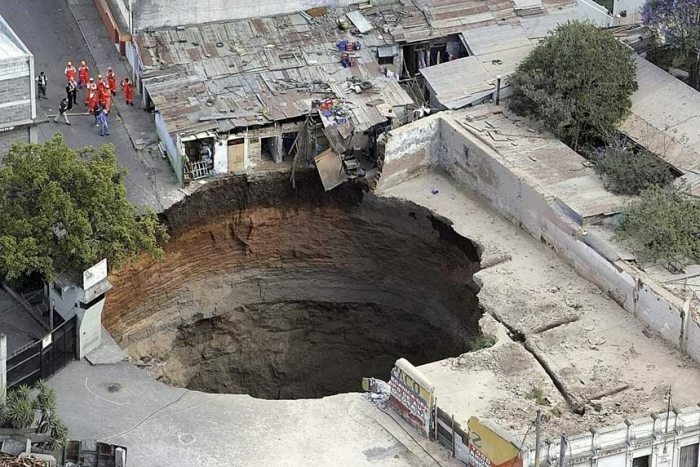 Though the theory is nice, but my initial thoughts were 'where are the sinkholes'? None have been discovered, not that they would be like the recent sinkhole in Guatemala (picture from Guatemalan Govt.). I had settled on the personal hypothesis of these being slips of old faults. There are many of these faults throughout the area, but they have been inactive for a very long time (even in geologic time). This slipping can be stress built up over long periods of time, introduction of fluids, or loading of the land. I even thought about a fault running under the railroad bridge in Decatur which does not break, but creeps slowly. That bridge has been rebuilt several times due to fault movement. I heard that people were rushing to buy earthquake insurance and couldn't help but to (almost literally) fall out of my chair laughing. These are not indications of further earthquakes. We don't know what exactly is happening, but that is mostly because the area is poorly mapped and we have little geophysical data available about it. Could more earthquakes happen? Absolutely. Will they? We can't say. Next we must discuss how earthquakes are rated. We use the Richter scale, which is a logarithmic scale. This means that each step is an order of magnitude more energy. A 3.0 is ten times larger than a 2.0, so a 4.0 is 100 times larger than a 2.0. News media commonly misses this and says it was 'twice' as large which is simple ignorance. We also know it takes a 4.0+ to start breaking glass and doing serious damage. I have only head reports of a few cracked driveways and see no reason to expect anymore. Finally there is no 'trend' with only two data points to support earthquakes getting stronger.